Here is the Breaking News, albeit from January 1987! New World Pictures have snaffled up Spidey and the rest of the Marvel Comics Group. 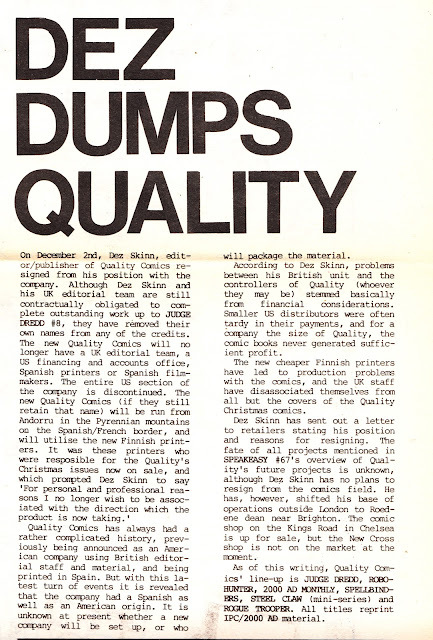 This was the lead story from British fanzine SPEAKEASY issue 70, cover-dated January 1987. The prediction that the sale would have no effect on Marvel's staffers turned out to be wide-of-the-mark, Marvel's new owners didn't waste too much time in dispensing with the services of Editor-in-Chief Jim Shooter. But we'll get to that. 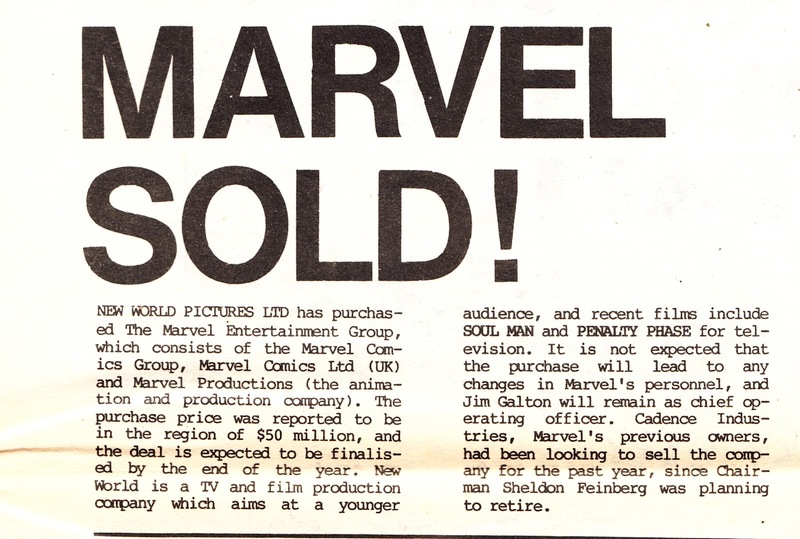 I've covered the post-Corman rise and fall of New World Pictures/ Entertainment in a previous post but, to cut a long story short: their core business of movies and television production lost shedloads of money, Marvel was sold-off to keep the wolf from the door and NWE eventually reinvented itself as a TV station group (with some production, including the GENERATION X tele-flick) before being absorbed by News Corporation (who wanted to add New World's local stations to their existing Fox station group) and ceasing to exist in any meaningful sense. Marvel after New World had a turbulent 1990s, spent the first part of the noughies redefining itself and is now, of course, a lucrative part of the Disney empire. The other front page story that issue was Dez Skinn's hasty departure from Quality Comics over - ironically - quality issues. QC, and Skinn, had been making a splash in '86 having acquired the rights to repackage and reprint the 2000AD back catalogue (as well as other IPC archive strips) from Eagle Comics (the joint-venture between IPC and Titan Books). Skinn had planned to use these low-cost (creators, notoriously, didn't receive extra payments for reprints or reuse of their work) reprints as the basis to grow the Quality line. After his departure, Quality became notorious for poor production standards and sloppy reprints. Numerous titles were released under the Quality/ Fleetway banner and, one day, I'll get around to featuring some of them here. 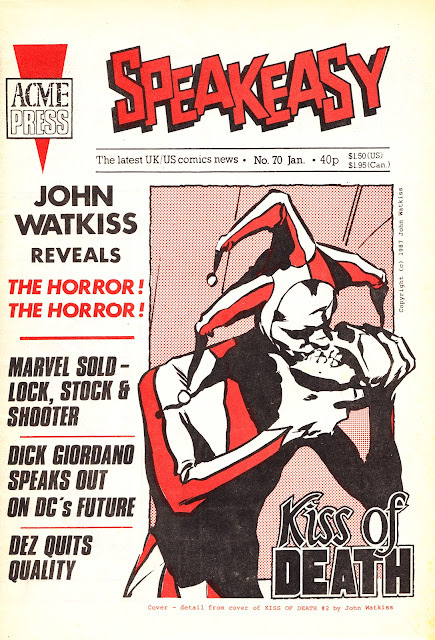 SPEAKEASY was a well-established British fanzine which, by this point, had positioned itself as the main "newspaper" for British comics fandom. Taking this to it's logical conclusion, it had adopted a newsprint tabloid format, folded to A4 size for display and sale (which explains that nasty brown line through the news stories, that's where the fold is! ).